The Bay Area’s prosperity is threatened by fragmentation in the public transit system: Riders and decision-makers contend with more than two dozen transit operators. Despite significant spending on building and maintaining transit, overall ridership has not been growing in our region. How can we get more benefit from our transit investments? In many ways, having so many different transit systems makes it harder for riders to understand and use the services available to them. From divergent maps, schedules and fares to uncoordinated capital planning and investment, the fragmented nature of our transit makes it less efficient, less usable and less likely to help us meet our goals for a thriving and sustainable region. By integrating our many public transit services so they function more like one rational, easy-to-use network, we have the opportunity to increase transit ridership and make better planning decisions for the future of our region. 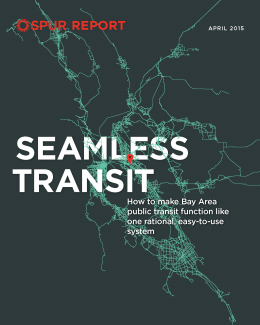 SPUR proposes five strategies for integrating transit services across the Bay Area.